A big congratulations goes out to Concetta Mezzanotte, who has just scooped a cool $20k on our sizzling Summer Raffle! Concetta, who got her entry in the raffle after picking up a full EuroMillions bet slip (6 games), was delighted to claim the $20k bounty and plans to put the money towards her daughter’s future. 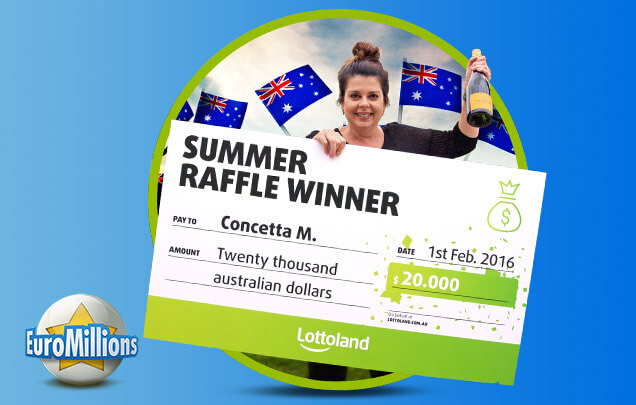 Speaking to Lottoland, Concetta beamed, “I’m stoked; I can’t believe I’ve won. The Lottoland $20k Summer Raffle took place after hundreds of thousands of players flocked to Lottoland to bet on the $2.1 billion world record jackpot of the US PowerBall. To take part players had to submit full bet slips on any lotto game, with the order number then to be used as their ticket for the raffle. As well as the top prize, we handed out 50 more 52-week long bets for Tuesday Lotto! Our 50 lucky winners are listed below, so check to see if your name is there and if it is your prize will be waiting for you in your inbox. If you want to take part in great promotions like our $20k raffle AND bet on the biggest jackpots the world has to offer then sign up at Lottoland now. Just remember to opt-in for our promotional newsletters and to set notifications in the ‘My Account’ section to ‘E-mail – don’t’ miss a thing!’.